Sick Building Syndrome or Building-related Illness may be more common than you think. I have been a victim of SBS twice over. You can read my story below. Building-related Illness is a modern disease of our air-tight energy efficient homes and the stagnant chemical or biological pollutant filled air that may consequently accumulate indoors. Have you ever experience sudden itchy eyes, headache, stuffy nose, nausea, or dry cough which seemed to correlate with time spent in a particular building or home? Did you ever hear others complain of having the same symptoms at the same time and in the same place? If so, this may have been indications of Sick Building Syndrome and a toxic indoor environment. No one is immune to poor indoor air quality. Even the EPA has encountered problems with Sick Building Syndrome when many employees became ill following relocation into new offices a few years ago. That new home smell of paint, carpet, and particle board is as bad or worse for you as is that new car smell. Read on to identify, control, and eliminate the major contributors to building-related illness. You deserve a healthy home! 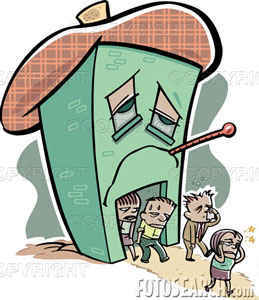 -- What is Sick Building Syndrome? -- I Was a Victim of Sick Building Syndrome TWICE! -- Are My Symptoms Really Due to SBS? -- What Are Some Tips for SBS Mitigation? Sick Building Syndrome started to become a problem in the early 1970's when increasing numbers of people began reporting allergic-like reactions and headaches from unspecified causes. Sick Building Sydrome has increased in frequency in direct proportion to the increased energy efficiency of modern day buildings and ever more complex man-made chemical products. SBS symptoms result from build up of vapors and particles from off gasing and breakdown of these products in tightly sealed buildings which are poor in ventillation. Over the years symptoms such as fatigue, nausea, dizziness, headache, and irritation of the eyes, nose, throat, and mucous membranes began to be associated with the complaintant's having spent time in a certain building or buildings. 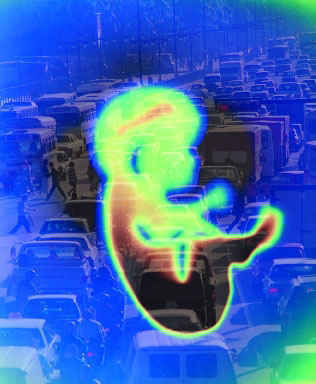 The symptoms were observed to disappear or subside when the person was no longer in the buildings. The association between the presence or disappearance of specific allergy-like symptoms in relation to specific buildings began to be known as Sick Building Syndrome. Sick Building Syndrome is of particular concern for asthmatics or allergy sufferers since they are more prone to indoor allergens. Sick Building Syndrome is also a common problem among lower income inner city housing where a lack of modernization and sanitation can greatly increase allergen concentrations indoors such as from rat droppings, cockroach body parts, dust, gases, and other biological pollutants. Anyone can become a victim of Sick Building Syndrome. In fact most of us probably have been an SBS victim at least once or twice in our lives, but may not have known our home, place of work, or school was the culprit. I personally have been the victim of Sick Building Syndrome twice - once in a house I lived in long ago, and another time at University. I say victim because, unlike now - in my own much healthier home - THEN I did not have full control over my environment, or at least the control I do now to remove sources of suspected indoor air pollutants, increase ventillation, and to use air cleaners. The house incident was related to a whole host of indoor air pollutants which included a drum of chlorine tablets (and other pool chemicals), many bottles of Ortho pesticides, and gasoline cans being stored in the crawlspace. The fumes infiltrated into the living space above for years. This old house also had lots of black mold and mildew from previous water damage, on-going drainage issues, and plumbing leaks near sheetrock. There was also extensive renovation underway for a long time. So off-gasing of Volatile Organic Compounds (VOC) from paint, lacquer, paint thiner, ect. was common. Lots of toxic household chemicals were also regularly used which probably didn't help with the VOCs. Then add in an old gas-fired furnace and dirty leaky air ducts, pet dander, and pesticides. There's no telling what the Radon gas level would have been in the old musty built-in basement where my bedroom was. We never tested for Radon, as hardly anyone did back then. The big government PSA push for everyone to test for Radon gas didn't come until later once they learned Radon is actually the SECOND leading cause of Lung Cancer. But at any rate, Radon gas is colorless, odorless, and is not likely to contribute to the acute respiratory problems or allergies consistent with Sick Building Syndrome. You are likely breathing Radon gas and its radioactive decay products right now. Most homes have at least some Radon gas coming in from the earth below, but still others can have quite a lot, especially where there are Granite rocks. I highly recommend you test your home for Radon or you will never know the levels until it is too late. As you can read below, smokers are particularly screwed if their homes have elevated Radon. Check out my lab Rad-Badge story below too for even more reason to pity smokers and avoid any Second / Thirdhand Smoke - otherwise known as Environmental Tobaco Smoke (ETS). 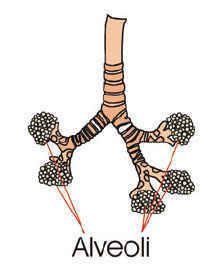 Smoke a Cig and inject radiation directly into your Alveoli, on top of any damage from Radon or its decay products. Anyway, back to the old sick house. While living there in this multi-layered soup of airborne toxins, I suffered with continuous nasal allergies and infections, frequent colds, frequent headaches, frequent soar throat, dry coughs constantly, stuffy nose, allergic skin rashes, and eye irritation. I was sick a lot more back then, for sure. When you are living in a Sick House often you just become used to your respiratory health bar being set lower. The suffering becomes the norm. But once you move to a healthier home and out of the sick building, THAT is when you really become aware of just how low the bar was set on the air quality in the toxic indoor environment you got used to suffering in. You will never want to go back once you get used to cleaner air in a much less toxic home. The before and after contrast really made me wonder how widespread the problem of Sick Building Syndrome might be. I wonder how many sufferers are needlessly living in a haze of indoor air pollutants, not even realizing just how bad their indoor environment is making them feel or what the long-term health costs might be. An even more heightened awareness of Sick Building Syndrome in schools came about while I was attending Clemson University in the mid 1990's. Clemson University is an old state college, and thus has some old buildings. My major was Biochemistry and I know many of the old buildings I frequented for classes had poor ventilation, hazardous materials, numerous biohazards, and lots of hazardous chemicals being used liberally and often with poor environmental controls. College labs are very dangerous places, by the way, because students are often very complacent and often sloppy with safety protocol, and sometimes just don't understand well what they are working with. At least that's how I remember it. While I was there, there was one old building in particular that made headlines for being amoung several on campus that students were complaining may have been causing Sick Building Syndrome. All the health complaints by students made the 6 o'clock news several times and if I remember correctly the suspected campus SBS had mostly to do with mold, possible Carbon Monoxide, and poor ventilation. Students' symptoms included burning eyes, headaches, naseau, respiratory difficulty, and dizziness. But in my experience, chemicals were a big part of what often made me ill during class. In bioengineering, genetics, and biology labs we used a lot of hazardous and carcinogenic chemicals. "Chemical Hygeine" was not always so good and you could smell contaminants in the air often. One lab was rendered unusable and we had to evacuate because it was discovered a previous class had spread radioactive isotopes all over the room following a Biochemistry experiment. I think it was Deuterium with radioactivity confirmed with floor and lab bench swabs measured for routine radiation safety monitoring. But those type things routinely happen in college, lol. But what concerned me more was the fact that you could always smell Phenol and Formaldehyde throughout one old multi-story Bioscience department building. I guess the hundreds or thousands of jars of pickled organs and specimens scattered about in many classrooms on floors didn't help the air quality much. The place smelled like a mortuary had exploded. I could always tell which buildings were the most sick buildings on campus because every time I would spend more than a half hour there, I would get a headache and eye irritation, often with dry cough and itch throat too. In general I would just feel sick, like a medicine head feeling. It was often a relief to get back outside where the air was less stale and probably a lot less polluted. As soon as class was over and I was outside...yup, you guessed it...the symptoms would subside and often disappear. That is a sure sign of Sick Building Syndrome, if your respiratory difficulty or headache seems to be associated with a particular home or building with others sharing the same apparent building-related illness. So yes, I got schooled on Sick Building Syndrome while at school. Sometimes Colleges and Universities teach you more than you bargained for. I earned a degree in SBS while earning my BS, I guess I could say. But just for the record, Clemson is a fine University and I believe they have fixed most or all of their alleged Sick Building Syndrome issues - probably with better ventillation (more air changes per hour), better chemical hygeine policies, and newer green building practices and safer materials. But it leaves one wondering just how many places of higher learning may still be places of higher indoor air pollution. When I look back on my run-ins with Sick Building Syndrome, I realize my experiences are a big part of why I became so passionate about helping others find ways to reduce indoor air pollution, and why I started Home Air Purifier Expert.com. I hope my experiences and increased awareness about indoor toxins can help others, like you, to take a look around and consider what in your school, office, or home air might often be making you feel ill.
Pollen, moldspores, bacteria, tobacco smoke, formaldehyde, methylene chloride, hydrogen cyanide, ammonia, particles, hydrocarbons, carbon tetrachloride, benzene, ozone, and bioaerosols are some examples of possible contributors to Sick Building Syndrome. 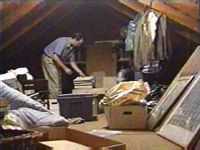 The key to whether you have a sick building or healthy home may depend on your Attic Space. There are 4 main categories of indoor air pollutants that contribute to Sick Building Syndrome symptoms: Combustion Pollutants, Biological Air Pollutants, Volatile Organic Compounds (VOCs), and Heavy Metals. Sick Building Syndrome has also been known to be associated with poor lighting, bad acoustics, or poor ergonomics. 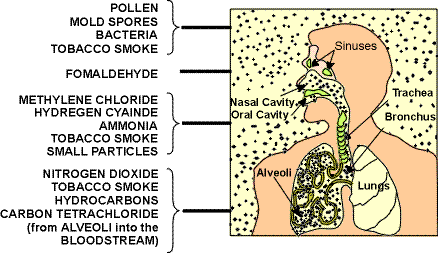 However, most cases of SBS are related to the following major airborne pollutants and how they interact with our immune systems and mucous membranes particularly in our respiratory system and specifically our lungs. Carbon Monoxide (CO) - gaseous asphyxiant (can kill you by preventing oxygen from entering your blood). Sulfur Dioxide (SO2) - gaseous irritant. Nitrogen Dioxide (NO2) - gaseous irritant. All three of these combustion pollutants may be formed when heating or gas fired appliances do not operate or vent properly. When inhaled, Methylene Chloride may also breakdown to form Carbon Monoxide as well. 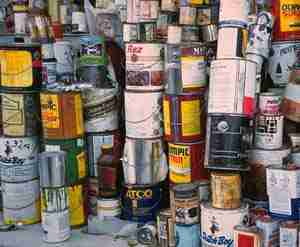 Methylene Chloride is a common toxic solvent used in many paint products like strippers. Toxic Black Mold from moisture damage or high indoor humidity is probably the leading cause of Sick Building Syndrome and Building Related Illness. Dust mites that thrive on the constant supply of shed human skin cells that accumulate on carpeting, stuffed animals, drapes, furniture coverings, and bedding. Skin cells (Dander) of pets (the smallest and most allergy causing being cat dander). Pollen from trees and plants carried inside on shoes, pets, or breezes through open doors or windows. Viruses, Bacteria, and other Bioaerosols are common in every home and may increasingly contribute to Sick Building Syndrome if humidity levels are either too low or too high, due to how their growth and our respiratory system is affected. Insect body parts are especially potent allergens for some people. Cockroach allergens are particularly potent allergens and are commonly implicated as contributors to Sick Building Syndrome in urban housing with poor sanitation. Toxicosis involving the toxic effects from toxic chemicals produced and released by biological organisms such as toxic black mold, mildews, bacteria, and other microbes. Infection of human hosts whereby pathogens like bacteria or viruses invade the body and attack tissues. Hypersensitivity as a result of the body's immune responce to Biological invaders like viruses or bacteria. ice damming on building roofs which allows water to seap under shingles and through roof sheathing. Volatile organic compounds (VOC) off-gasing from the paint on the walls of your home or office may be one of the biggest contributors to your Sick Building Syndrome symptoms. Reduce indoor air pollution from VOC emissions by using only non-toxic paint certified as no-VOC or low-VOC. Here's our guide to VOC emitting paints including a list of leading manufacturers of low VOC, non-toxic paint. Many solids and liquids in your home emit toxic volatile gases into your indoor air which are likely to contribute to symptoms of Sick Building Syndrome. These Volatile Organic Compounds or VOCs come from the chemicals contained not only within the structural components of buildings, but also from the contents or activities in those buildings. Some examples of specific VOCs are perchloroethylene, formaldehyde, benzene, household solvents, pesticides, ammonia, and many cleaning agents contained within common household products. Of particular concern is Formaldehyde which is a very common VOC in most homes yet is one of the most dangerous since it's a strong respiratory irritant and carcinogen as well. Formaldehyde in FEMA trailers caused a lot of health complaints after Hurricane Katrina in 2005/2006. Cigarette smoke is another major source of not only VOCs, but also thousands of toxic chemicals, hundreds of carcinogens, and very fine soot like particles that penetrate deeply into the lungs. Cigarette smoke also contains toxic heavy metals and even radioactive isotopes like Americium and Polonium which is absorbed by tobacco plants from the soil and injected directly into the deepest recesses of your lungs with every breath you take of environmental tabacco smoke (ETS). In the inorganic laboratory in which the home air purifier expert used to work we were required to wear what are known as "RAD badges" in order to record our potential exposures to radiation from instruments such as our XRF unit. After having the radiation badges tested for dose, it was noticed that for some reason several lab personnel had elevated levels of radiation exposure, enough to be of concern. It didn't take long to find a trend which showed that the only Rad badge wearers with elevated radiation levels were all those who smoked. It turns out that the Environmental Tobacco Smoke (ETS) and second-hand smoke from their cigarettes was the culprit. The smoke was exposing the badges (worn on lab coat pockets) to radioactive decay energy from such isotopes as Americium and Polonium carried within their cigarette smoke particles (Tobaco plants have an affinity to absorb the isotopes from the soil). This trend of elevated radiation dose for lab cigarette smokers persists each and every time the Rad badge results come back. Yet another reason I am happy not to be a smoker. It's no wonder smoking is the leading cause of lung cancer. It's a no brainer that if cigarette smoking is allowed in your home or your work place, the symptoms of Sick Building Syndrome may well be due to inhalation of the second hand smoke and possibly a synergistic interaction of Environmental Tobacco Smoke with other air pollutants. Now a new term "Thirdhand Smoke" has been coined to describe the cigarette smoke chemical residue contamination that has been shown to often coat the insides of buildings, people, clothing, furniture, HVAC ducts, ect. in the toxic wake of smokers. But besides the acute affects of cigarette smoke, there are deadly chronic affects too. For example, smoking is the leading cause of lung cancer deaths in the U.S.
Now consider that the SECOND leading cause of lung cancer deaths in the U.S. is Radon. Radon is a very dangerous gas resulting from the radioactive decay of Uranium within the Earth's crust. If you smoke cigarettes AND you breath elevated levels of Radon over the long-term the odds are in favor of you developing Lung Cancer or other potentially deadly lung disease. Radon is detectable in almost every home in the U.S. and is a very big public health concern depending on how much is entering a particular building. Unless you test for Radon gas levels you will never know how much you are breathing because Radon is odorless, colorless, and produces no emmediate symptoms. However, if you are exposed regularly to cigarette smoke AND you are also exposed to elevated Radon gas levels at the same time, you have a MUCH MUCH HIGHER RISK OF LUNG CANCER than with either exposure separately. This is an example of a synergistic interaction between indoor air pollutants. There are many well documented cases suggesting death rates from lung cancer is statistically elevated upon exposure to both high Radon and cigarette smoke together over longterm periods. As proven by my story about the Rad Badges above, as a smoker inhaling Radon, you get a double dose of radiation deep into every nook and cranny of your lungs' alveoli (air sacks) because the Tobaco smoke contains significant radioactivity too. KEEP SMOKERS OUTSIDE IF POSSIBLE and if you smoke do everything you can to try to quit. Lung Cancer or Emphasema is not a pretty way to go. And EVERYONE should have their home tested for Radon gas levels. VOCs are amoung the smallest and most damaging of indoor air pollutants. Because of their molecular size, Volatile Organic Compounds will pass straight through even the best HEPA air filter. Therefore, most home air purifiers and air duct filters will not help to reduce these very damaging gases in your air. Special gas-phase filters containing Activated Carbon, Zeolite, Potassium Permanganate, or other special sorbent materials are required to remove VOCs from indoor air. The absolutely best home air purifier brand with models able to filter gaseous VOCs as well as near 100% of all the other indoor air pollutants that may be contributing to symptoms of Sick Building Syndrome is IQAIR. Besides gas-phase cartridges that absorb Volatile Organic Compounds, there is a new ionic home air purifier technology availble which may be even more effective. It is known as Hydroxyl Radical purification and it may be particularly effective for neutralizing airborne VOCs. However, even more promising is the evidence suggestion that Hydroxyl Radicals may even neutralize the sources from which the VOCs are emitted, such as from paint on walls, particle board, carpeting, or plastics. Hydroxyl Radicals are powerful oxidizers which react with the VOC molecules to break them down into much less damaging by-products. Like Ozone molecules emitted by Ozone air purifiers, commercial Ozone generators, and some ionic air purifiers, Hydroxyl Radicals seek out and destroy many of the gases that cause Sick Building Syndrome. However, unlike dangerous Ozone gas, Hydroxyl Radicals do not persist for hours or days or cause tissue damage like Ozone gas is known to do. This ability to neutralize VOCs at their source while emitting virtually no Ozone is a major reason the Japanese-made Sharp Plasmacluster FP-N60CX the best ionic air purifier available on the market today. It is also very quiet and includes a large amount of activated carbon in a WASHABLE gas-phase filter which enable the capture of yet more of the potentially thousands of different VOC gases. There's also a washable pre-filter and a very high quality HEPA filter to catch almost 100% of lung penetrating particles down to 0.3 microns in size. These washable filters mean that replacement filters may not be needed for up to five years! This together with its energy efficiency makes the Plasmacluster a very cost effective purifier, and the hybrid ionic-HEPA air filter system make it an effective method of combating Sick Building Syndrome. Though it can only be one part of a wise air purification system involving ventillation, air cleaning, and source control. As effective as the Plasmacluster air purifier might be, it is unreasonable to think that it alone will be able to capture or destroy all indoor air pollutants that may cause Sick Building Syndrome. Therefore, the most logical way to keep VOCs from making your building and you sick is by practicing source control. In other words, identify and elliminate as many sources of chemicals vapors as is practical. One of the major hallmarks of the human race is our use of man-made chemicals to manipulate and create unique environments. Therefore, due to our policy of "Better Living Through Chemistry" you should not expect to be able to eliminate all chemical or VOC sources. So you should just try to identify and reduce the major sources where practical. Household products like hair spray, perfume, room deodorizer or scents, finishes, paints, thinners, oven cleaners, glues, markers, photo chemicals, adhesives, vinyl shower curtains, foam bedding, and rug cleaners. Visit my Extensive Household Chemical Encyclopedia to identify what is in over 100 other common household chemical products through out your home. appliances and electronics such as copiers, printers, computers, televisions, sterios, and yes even air purifiers! Structural building components such as blown foam insulation, caulking, wall coverings, flooring, carpet backing, particle board, fiberboard, other press wood products, structural adhesives, finishes, paneling, and plywood. VOCs may become a particular problem when a building is being renovated or constructed because many of the above sources are much more likely to be used and become airborne. Extremes in temperature and humidity also affect the release of Volatile Organic Compounds. I highly recommend testing your home or workplace for VOC, Formaldehyde, and Mold if you suspect Sick Building Syndrome. Click the banner below to get the best professional-grade test kit on the market today at a fraction of what indoor air quality experts and home inspectors are currently charging for the same test kit. It is a snap to set up and run, you can easily do it yourself and save a lot of money by cutting out the middle man. And the scope of the test and expert support and recommendations is phenomenal. 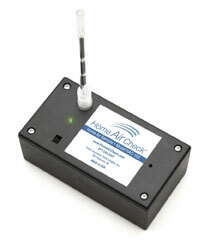 Home Air Check accurately measures over 400 Volatile Organic Chemicals, Formaldehyde, and more than 20 Mold Volatile Organic Chemicals (MVOC) - which is much more sensitive and accurate than the common Mold Spore tests. MVOC detection is the best way to know if your building has hidden mold colonies that would otherwise be difficult to detect. Heavy Metal compounds in various household products may contribute to Sick Building Syndrome; however, thanks to public awareness and legislation, airborne heavy metals aren't as much of a problem in buildings as they used to be. Nevertheless, older buildings in particular may still contain significant amounts of several toxic heavy metals. Older buildings are often sick buildings because of many of the above contributors such as mold. However, they may also contain two of the most toxic heavy metals - Lead and Mercury. You definitely don't want these two inorganic contributors to Sick Building Syndrome in your home or work place. But they probably aren't much of a problem if the building you are in was built after the early 1990s. Indoor paint manufactured prior to 1990 and outdoor latex paint manufactured prior to 1991 may contain Mercury (element symbol Hg from latin word Hydrargyrum) which was added to paint primarily because Mercury is an effective fungicide and biocide. In fact there is controversy over the continued use of Mercury in vacinations and medical solutions for the benefit of these same anti-fungal and biocidic properties. Though unproven, some parents fear Mercury in the form of Thimerosol added to vaccines may correlated to the rise of Autism in children. Mercury causes a host of health problems including birth defects, abnormal behavioral changes, and permanent neurological damage. As Compact Fluorescent Light bulbs (CFL) displace incandescent light bulbs as the more energy efficient standard, there is growing concern about the Mercury contained within these CFL bulbs. But it is a tiny amount of Mercury - about one hundredth of that in a typical Mercury Thermometer. As long as the bulb does not become broken the Mercury will remain sealed inside the bulb. But if CFL bulbs do become broken, the Mercury inside will quickly vaporize into the air and can be inhaled. Special clean-up steps will be needed. NEVER vacuum Mercury because it will only spread the Mercury contamination. Lead (element symbol PB from latin word Plumbum) is another common problem in older buildings because prior to 1978 it was still being added to paints. Lead-based paint in older structures is still a major problem particularly when the residues are disturbed and become airborne such as during rehab, renovation, or construction projects. Lead-based paint test kits are available to homeowners and will help identify these toxic residues. Otherwise, it's wise to assume all older paint residues may contain these toxic heavy metals and thus should never be disturbed. Seek professional assistance with Lead removal. Lead-based paint removal should only be attempted by certified professionals who use special HEPA vacuum cleaners for Lead Dust. Lead removal experts are also trained to follow strict containment and disposal protocols to keep airborne lead exposure to a minimum. Several household products still may contain some Lead or Mercury. For example, some hair coloring products contain Lead and concrete mixes may contain some Mercury. Overall, unless your building or home is older, and is being renovated, or is deteriorating, heavy metals probably aren't the most likely contributors to any suspected Sick Building Syndrome. 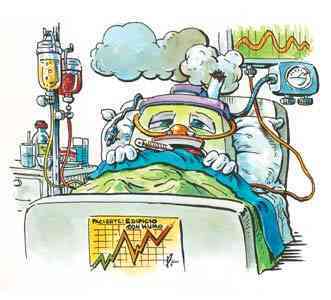 Are My Symptoms Due to Sick Building Syndrome? So how do you tell if your headaches, nausea, dizziness, itchy eyes, dry cough, fatique, or throat irritation is really due to Sick Building Syndrome? Usually two patterns will emmerge. The first pattern is when others beside yourself are also having the same symptoms while in the building. Also If the same symptom sufferers report that their symptoms seem to go away when they leave the building, then this might be a sure sign of Sick Building Syndrome. If just one person seems to have problems in a particular building or part of a building yet no one else is effected, it is possible that that person may suffer from a particular allergy or sensitivity to something in the building. That does not mean that the building is necessarily a sick building. A common example of the above distinction is with someone who suffers from what's known as Multiple Chemical Sensitivity (MCS). These individuals are extremely sensitive to one or many airborne chemical vapors, particularly the VOCs mentioned above. Just because they get a whif of Methylene Chloride from a fresh paint job at work and fall ill only when on the clock does not inherently indicate Sick Building Syndrome. These individuals will usually have a history of symptoms in other situations unrelated to the building in question. It is important to be able to differentiate between isolated sensitivities and group symptoms because Sick Building Syndrome mitigation can require significant structural, mechanical, or logistical remedies, most of which can be potentially very costly. "I Suspect Sick Building Syndrome, So What Can Owners or Occupants Do About Building-related Illness?" First track and document your SBS symptoms - those that mysteriously disappear when you and other sufferers leave the building. Have all sufferers consult with a health care professional(s), notify the owner of the suspected sick building symptoms, and seek assistance from your local health department. Taking the above information into consideration, try to identify the sources of your building-related illness and attempt to reduce or elliminate them where practical. Ban smoking inside the building. Also discourage use of colognes, air fresheners, scented candles, perfumes, hair spray, inscence, and other aromatic products. Open doors or windows to increase air ventillation. Introducing more fresh air will dilute and "flush" pollutants from inside. Nine air exchanges per day is the recommended level of ventillation. It's good to ventillate, but also keep in mind that humidity levels and temperature swings can affect biological contaminants like mold spores and also how much VOCs enter the air. Remove water damaged furnishings, ceiling tiles, or carpeting. Have the heating and ventillation system (HVAC) checked for contaminated duct work, air exchange efficiency, or maintenance issues. Hire a professional to clean the air ducts, particularly if Toxic Black Mold spores are detected within your HVAC system. Elliminate poor lighting, ergonomics, and acoustics which have all been associated with sick building symptoms. Use VOC-free paint and other environmentally friendly healthy home products. Do not store household chemicals in or directly adjacent ot living areas. Use household chemicals like solvents, paints, pesticides, adhesives, and thinners sparingly (if at all) and only in well ventillated rooms preferably during hours of limited occupancy. Test building air for indoor air pollutants such as particulates like pollen, dander, dust mites, and mold spores. You can also test for humidity levels, carbon monoxide gas, formaldehyde gas, and Radon gas. Supply ventillation in areas where electronic equipment or appliances such as photocopiers, computers, and fax machines are frequently used. Make sure electric and gas-powered appliances are operating and exhausting properly. Ventillation fans have been known to cause back-drafting of deadly carbon monoxide into living spaces, so beware of low indoor pressure particularly when exhaust ducts are passively exhausted. For more information about Sick Building Syndrome or anything else for that matter, please feel free to contact the home air purifier expert. To see our latest updates visit the Home Air Purifier Expert's Blog.